Tungsten World’s Black Friday Blowout Gives Shoppers a lot to be Thankful for this Thanksgiving TungstenWorld.com adds new jewerly and accessories, in addition to huge Black Friday and Cyber Monday deals, this holiday season including watches, money clips, bracelets, earrings, pendants and cufflinks(PRWEB) November 20, 2012With Thanksgiving kicking off the holiday shopping season, TungstenWorld.com, the internet’s leader in tungsten wedding rings and tungsten carbide jewelry, is treating shoppers with Black Friday jewelry deals and Cyber Monday wedding specials on its amazing collection of tungsten rings and cobalt chrome bands. In addition to their holiday jewelry specials, Tungsten World has also added nearly 100 new accessories including watches, money clips, bracelets, pendants and cufflinks. As holiday shoppers are getting excited in anticipation of Black Friday and Cyber Monday deals, Tungsten World has announced a Black Friday Blowout featuring the best wedding rings and jewelry specials available. Shoppers looking for great stocking stuffers and gifts for Christmas will be treated to tungsten and stainless steel pendants for the low price of $29, down from $69. And to really get shoppers excited, TungstenWorld has announced their best deal of the year. Starting on Black Friday, all orders of $100 or more are eligible for 25% off the entire order with promo code from tungstenworld.com. Shoppers can save on any of Tungsten World’s jewelry and tungsten rings including tungsten diamond rings, inlay rings and even watches and bracelets. "Every year holiday shoppers are looking for only the best of the best when it comes to Black Friday deals and Cyber Monday specials, so we knew we had to go big on this one," says Brett T, Tungsten World Operations Manager. "The deals we are running for these pendants mean you can check a few people off your list for less than $100, and 25% off everything including our most popular styles like diamond rings puts our sale up there with the best." In addition to the great Black Friday steals and Cyber Monday jewelry deals, Tungsten World is also adding nearly 100 new accessories this holiday season for customers to shop and save on. 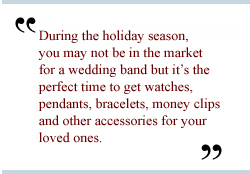 While it may not be the traditional season for weddings and wedding bands, customers can still treat the loved ones in their lives to a variety of stocking stuffers and great accessories including new styles of stainless steel and tungsten watches, money clips, bracelets, pendants, earrings and cufflinks. Keeping with Tungsten World’s tradition of durable and long lasting jewelry, all the the new styles feature the toughest in 316L stainless steel and high quality tungsten carbide. Many accessories also feature diamond stone or cubic zirconia inlay, solid gold accents or black and gold IP plating. To see all of Tungsten World’s newest products visit their Mens Jewelry & Accessories category with links to money clips, bracelets, earrings, pendants and stainless steel cufflinksfor men. "Adding the new accessories has been in the works for quite sometime and we're pleased to have them up just before the holiday season," says Brett. "During the holiday season, you may not be in the market for a wedding band but it's the perfect time to get watches, pendants, bracelets, money clips and other accessories for your loved ones. Our new line is the perfect balance of fashion savvy combined with durable, long-lasting metals." As the perfect gift for the man or woman in your life, Tungsten World also offers free Priority shipping to anywhere in the US. Customers shopping the new line of accessories or any of TungstenWorld’s line of long-lasting gifts and products will be sure to have their gifts in time for Christmas at no extra charge. About Tungsten World’s Tungsten ForeverTM Wedding Bands:Exclusive to TungstenWorld.com, Tungsten ForeverTM tungsten rings and tungsten wedding bands, for men or women, are made from the highest quality tungsten carbide. Hand-finished and coming in a wide array of widths, styles and sizes, Tungsten ForeverTM tungsten rings set the standard for durable men’s wedding bands guaranteed to last a lifetime. Coupled with Tungsten World’s industry-best Lifetime Replacement warranty and friendly customer service, customers purchasing Tungsten Forever™ tungsten rings and tungsten jewelry can be confident in knowing they’ve received the very best the internet has to offer.